Talk to your friends for free using your Wi-Fi or broadband Internet connection. 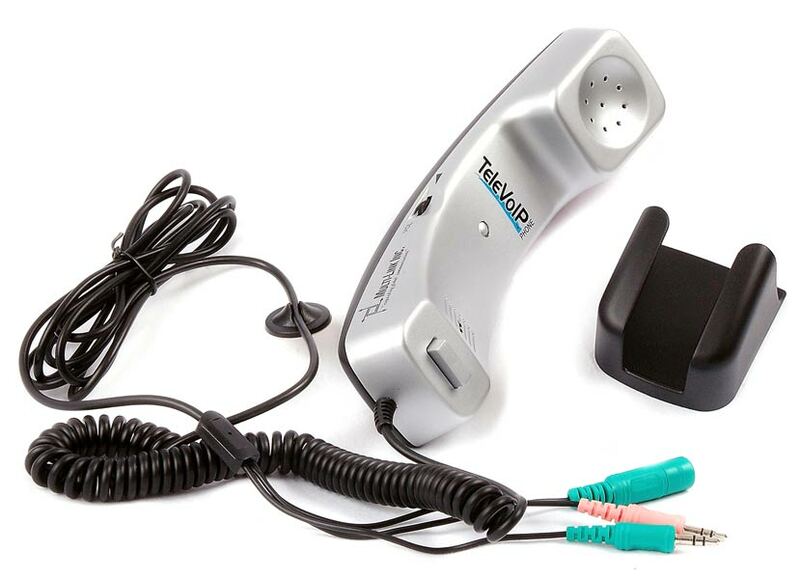 The TeleVoIP Phone plugs directly into your computer, so there's no need to wear headphones, buy a headset or have your conversation running through your loudspeakers. This phone provides the natural feel of a comfortable telephone handset and even includes a mounting bracket that can be connected to your monitor. With the TeleVoIP Phone, the computer rings like a real phone. When you lift the phone from the mounting base, your computer's speakers will mute automatically. The speakers automatically re-connect when the phone is put back after the call, and any system sound, music, or streaming audio will play again through your PC speakers. Setting up your TeleVoIP Phone couldn't be easier. This plug-and-play VoIP phone requires no drivers; just connect the handset to your computer through the included cord's two 3.5mm jacks, which plug into your computer's microphone and speaker slots; your existing speaker cord can connect into the phone, so you'll still be able to listen to music without unplugging the VoIP phone. No external power or sound card is needed, and the TeleVoIP Phone will work with any VoIP provider, even Skype, which provides free calls to other Skype users. Additional features include a convenient thumb-wheel volume control on the handset to adjust the earpiece volume. Dimensions: 8.5" x 2" x 1.5"